"Like 2D Minecraft," you say, "But that kind of sounds like Terraria!" About that. At least one of the devs on Chucklefish, the studio behind Starbound, hails from Terraria. This would explain some of the overt gameplay/aesthetic similarities between the two games. The premise here is that you're fleeing your destroyed homeworld in a shuttle, but you don't know where you're going. This is where the random-generation comes in, see. There is a ton of random-generation in this game, but more on that in a sec. So you'll be going around visiting a buttload of different planets that have everything from the flora, the fauna, the difficulty level, the weather and just everything in-between be randomly generated. Even the guns in the game will be randomly generated. Apparently there are 'literally millions' of combinations. Included are rocket launchers, pistols, assault rifles and so on which have a bunch of different stats and attributes (clip size, reload time, DMG, spread, etc) along with, as you might have guessed, rarity values. And of course, there will be terraforming. Once you make a planet your homeworld, you can interact or examine just about everything. Everything that makes a planet unique is at your command. Feel like changing the weather? Build a weather centre! Don't like the terrain? Terraform it! Every aspect of the planet is under your control. Once you're happy with it, start populating it with characters you've met in your travels and take care of them! They'll have needs and desires and won't hesitate to ask for your help if they require assistance. Sounds super ambitious. 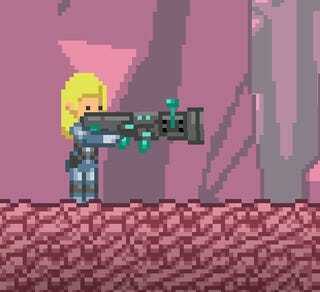 Starbound is possibly releasing at the start of 2013, but there's no clear release date.